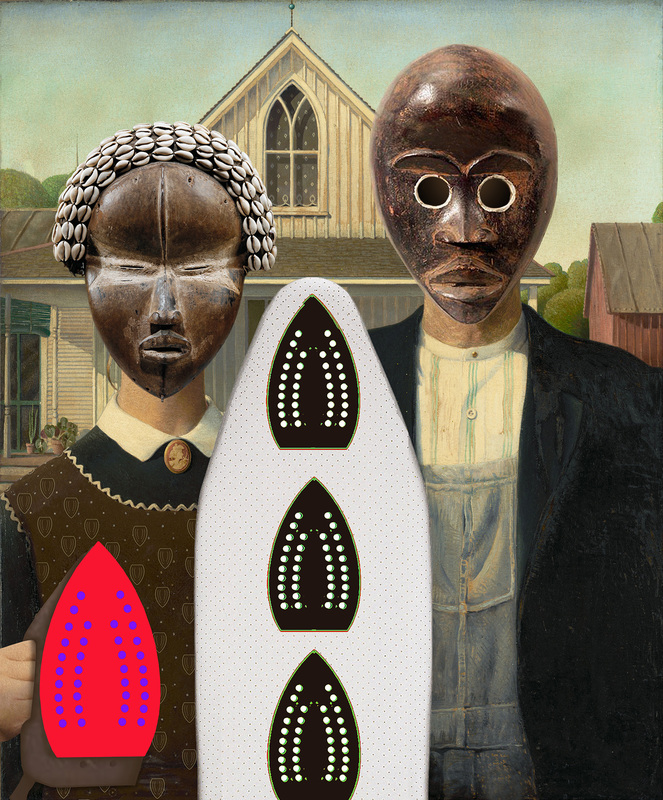 “Grant Wood’s iconic “American Gothic” (1930) has, over the years, been adapted for many purposes–artistic, parodic, comedic, commercial. In Willie Cole’s rendition of the work, called “American Domestic,” the pitchfork is replaced with an ironing board (of sorts–perhaps symbolizing a slave ship), the female figure is holding a red steam iron and her hair is replaced by cowrie shells, and both figures’ heads are replaced by forbidding African masks–the male’s with rounded hollows for eyes, and the female’s with thin slits for eyes. “In 1942, Gordon Parks went to work for the Farm Security Administration in Washington, DC. The American capital back then was a cesspool of bigotry. Parks had to enter restaurants and theatres through the back door. Even the federal government participated; the new war office then being built on the other side of the Potomac had separate eating and lavatorial arrangements for blacks and whites. 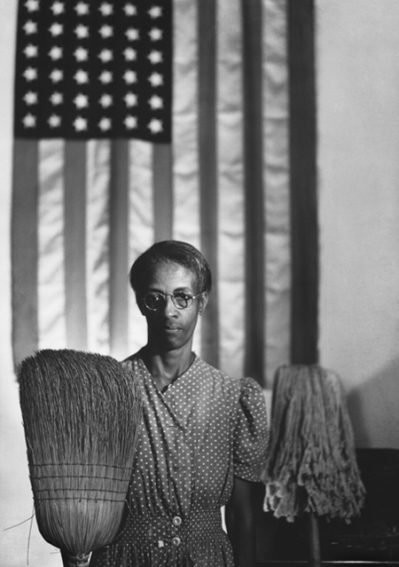 On his first day, Park took the photo of Ella Watson was a black charwoman who mopped floors in the FSA building. Park recounted how she was paid $1,080 annually (around $15,000 today), how one of the offices she cleaned was that of a white woman who had started work at the same time and with very similar qualifications, how she was raising three grandchildren and an adopted daughter on her meagre salary. 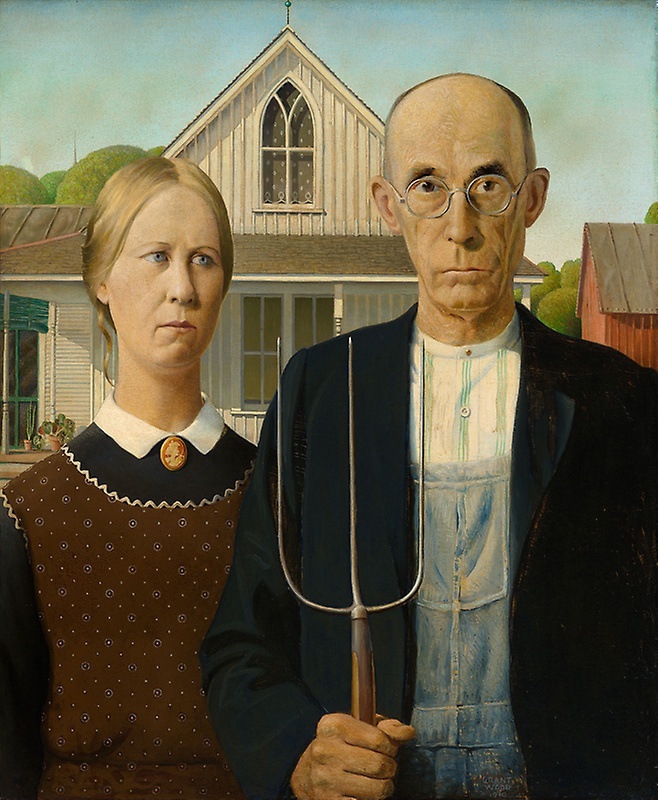 “This familiar image was exhibited publicly for the first time at the Art Institute of Chicago, winning a three-hundred-dollar prize and instant fame for Grant Wood. The impetus for the painting came while Wood was visiting the small town of Eldon in his native Iowa. There he spotted a little wood farmhouse, with a single oversized window, made in a style called Carpenter Gothic. “I imagined American Gothic people with their faces stretched out long to go with this American Gothic house,” he said. 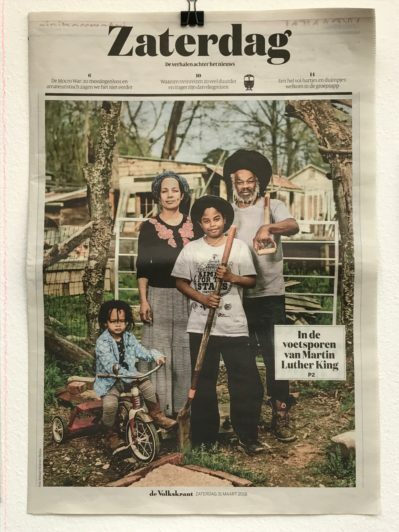 He used his sister and his dentist as models for a farmer and his daughter, dressing them as if they were “tintypes from my old family album.” The highly detailed, polished style and the rigid frontality of the two figures were inspired by Flemish Renaissance art, which Wood studied during his travels to Europe between 1920 and 1926. After returning to settle in Iowa, he became increasingly appreciative of midwestern traditions and culture, which he celebrated in works such as this. American Gothic, often understood as a satirical comment on the midwestern character, quickly became one of America’s most famous paintings and is now firmly entrenched in the nation’s popular culture. Yet Wood intended it to be a positive statement about rural American values, an image of reassurance at a time of great dislocation and disillusionment. The man and woman, in their solid and well-crafted world, with all their strengths and weaknesses, represent survivors.